In June, the President of the Supreme Court of Justice of Panama, José Eduardo Ayú Prado Canals, along with UNODC's Director for Policy Analysis and Public Affairs, Jean-Luc Lemahieu, and the Office's Regional Representative, Amado Philip de Andrés, visited several Panamanian indigenous locations to observe firsthand the way in which criminal procedure reform is improving the delivery of justice in these areas. Around five per cent of the adult population, or nearly 250 million people between the ages of 15 and 64, used at least one drug in 2014, according to the latest World Drug Report released in June by UNODC. Although substantial, this figure has not grown over the past four years in proportion to the global population. However, it suggests that the number of people suffering from drug use disorders has increased disproportionally for the first time in six years. Despite existing regulations, migrants face difficulties in accessing legal channels for migration and often turn to smugglers to reach their destination. In June, UNODC and the Secretariat of the Southern Africa Development Community (SADC) jointly organized the first ever regional meeting to discuss the challenges posed by migrant smuggling, bringing together immigration, police and judicial officials from 11 SADC Member States. In June, a biennial crime statistics conference was held in Mérida, Mexico, with a major focus placed on the Sustainable Development Goals (SDGs) and the data requirements for reporting on some of the key crime-related indicators. Organized jointly by UNODC and INEGI, the Mexican statistics body, the 3rd International Conference on Crime and Criminal Justice Statistics brought together around 400 participants from 37 countries. UNODC's Regional Office for West and Central Africa appointed a Goodwill Ambassador against trafficking in persons and smuggling of migrants - Senegalese singer and activist Coumba Gawlo Seck. In her newly appointed role, Ms. Gawlo Seck will help raise awareness and strengthen efforts to tackle these criminal activities, which continue to be challenges in West and Central Africa. 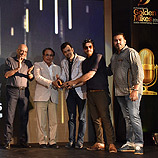 In June, UNODC's office in South Asia received several Golden Mikes 2016 awards, which recognize the best work done in Indian radio advertising over the course of the past year. Together with its local radio partner, Radio Mantra, UNODC's Regional Office was the only international organization in the country to receive awards in three categories - all in the fields of radio promotion and innovation. The 2016 World Environment Day, 5 June, called for each and every one of us to 'Go Wild For Life'. Driven by UNEP, UNDP, UNODC and CITES, the campaign aims to tackle the illegal trade in wildlife, and showcases how this crime erodes precious biodiversity and threatens the survival of a range of species. Copyright © 2016 UNODC All rights reserved.